Off late, I have been fascinated with all things yellow. 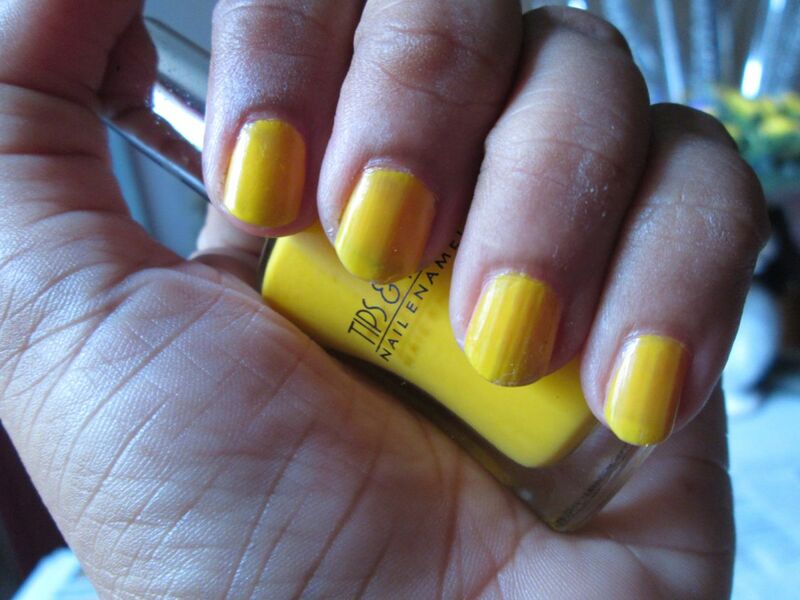 I have purchased a yellow shirt, jeans, a tee and the next on my list just had to be yellow nail polish. 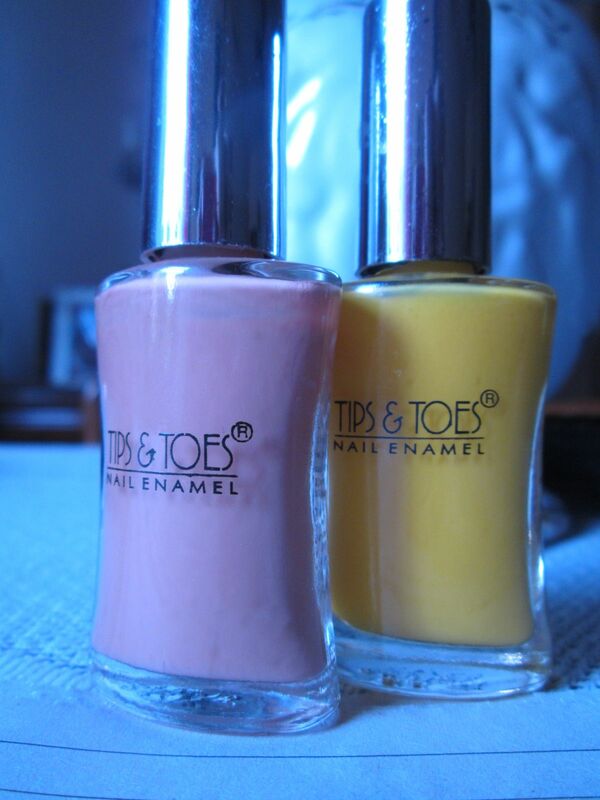 So when I spotted this cheerful yellow Tips and Toes Nail paint, I just purchased it on impulse without checking reviews as I usually do in case of any beauty product. I picked up two shades Moscow (45) which is a bright matte yellow without any shimmer and Delhi (47) which is a beautiful peach shade. The bottle is cute and tall and quantity is 9 ml for Rs 105. The brush is ok and of decent quality. Since the bottle is tall the brush is long and takes getting used to. I use a lot of mini paints so I am accustomed to the short brushes which give better control which applying the polish. The consistency of the polish is very runny. The first coat that you get is very uneven. 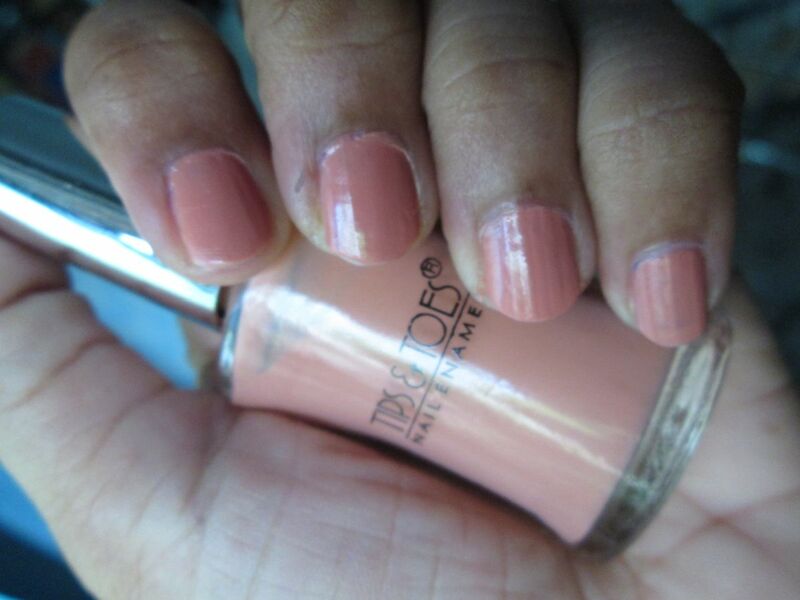 It takes at least 3 coats to get an opaque coat which is a bit uneven.Moreover, it takes a whole 10 mins to dry properly. The consistency of the peach shade (Delhi – 47) is much better than the yellow (Moscow – 45) which is disappointing as I really wanted the yellow shade to work. Delhi makes for really nice work wear nails. They look nice and elegant. But the yellow is a bit disappointing. I really need to apply it carefully with at least 3 coats. The polish lasts for two days without chipping after which it chips off in large chunks. I really do wish they start keeping nail paint testers. If I had tested these I would not have have purchased it at all. I think it’s best to stick to Lakme or Maybelline as you get better value for money. I think even cheaper VOV polish is better than this. I am not going to throw it out and will use it. I do hope that that application of the Moscow nail paint will get better as the polish thickens. Pros: Just about ok. There are better options, really! The peach one is actually pretty. But they are pricey for this quality. I am not much into nail polishes but I think Colorbar and Mary Claire offer very nice nail paints in the same price range. 3 coats is still bearable but waiting for 10 min for a nail paint to dry is just beyond my patience 🙂 I have one yellow shade from Viviana and that’s also a little runny.